Take a dive into the Search Encrypt Mac virus issue and get an effective walkthrough to stop annoying browser redirects leading to searchencrypt.com web page. Privacy on the Internet is a real buzzword and talk of the town these days. The numerous breach reports and questionably honest tactics of major data aggregates have been adding agitation to the discussion, encouraging users to look for services that deliver more anonymity than the instruments built into operating systems and web browsers. In pursuit of extra protection, though, those privacy-minded might choose the wrong tool. This caveat applies to Search Encrypt, a browser add-on that claims to hide one’s web searches from prying eyes of whoever wants to surveil, be it governmental eavesdroppers or identity thieves. When this extension is on board Safari, Chrome or Firefox on a Mac computer, it replaces the online navigation defaults with searchencrypt.com and doesn’t provide an easy way to revert the changes. 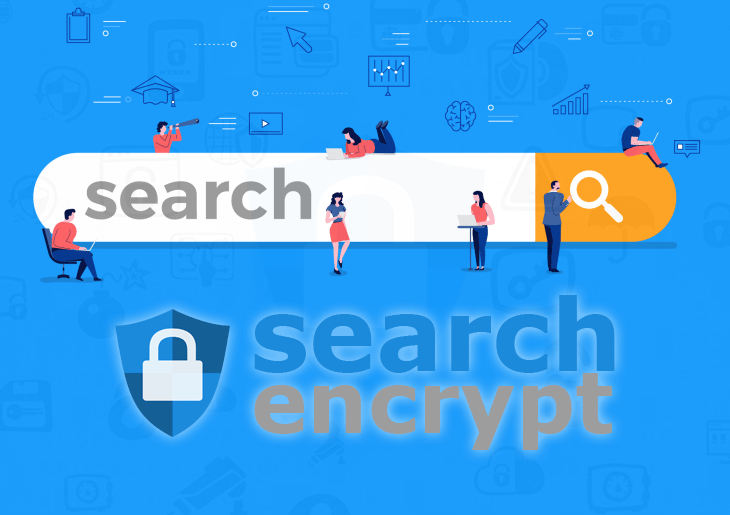 The mechanism of protection allegedly employed by Search Encrypt comes down to leveraging an advanced SSL encryption whenever a Mac user is looking up information on the Internet. Furthermore, according to the developers’ claims, all searches are wiped after half an hour of inactivity. While this seems like a fairly robust countermeasure for what remote observers may do, the big picture doesn’t look too comforting, to put it mildly. One of the serious giveaways in terms of this app’s real gist is about the way it is doing the rounds. Most people never actually download and install it – at least, that’s what they think. Here’s the thing: the Search Encrypt virus typically sneaks into a Mac without the admin’s awareness and consent. The technique that makes such a stealth possible is called bundling. In a nutshell, this is a means of cross-promoting software through multi-element install clients. Opting for the “express”, or “recommended”, setup workflow might get one’s computer infected with malware that’s kept out of sight. As soon as the Search Encrypt virus is in, it adds the related extension to the victim’s default web browser without asking for permission. This helper, or rather spoiler, object adjusts the Internet surfing routine on the host Mac to noxious malvertising activity. It overwrites the user’s preferences, including the search provider, new tab and homepage, and sets another URL instead. As a result, the web browsing will be stuck in a spiral of redirects to searchencrypt.com. Gauging by commonplace search engine design, the site in question is nothing out of the ordinary. It’s got a prominent search bar as well as a list of basic features of the underlying service. When a keyword or phrase is entered in there, the service returns results of its own while also offering to retry the same search on other engines, such as Yahoo!, Bing, or Google. The trick is that there’s a notice saying that in the latter case the user will be rerouted away from the “privacy-enhanced search engine”. This ostensibly trivial remark is a component of the devious marketing, the goal being to emphasize the purported pros of using the rogue service. To recap, the Search Encrypt malware infiltrates Macs in a furtive fashion, hijacks the web browsers, and imposes new Internet defaults. On top of that, it doesn’t yield to regular removal. The good news is that there is an effective workaround to eradicate the infection from Mac. Continue reading to get the relevant how-to’s. When confronted with malicious code like Search Encrypt on Mac, you can neutralize its toxic impact by leveraging a specially crafted system utility. The Freshmac application (read review) is a perfect match for this purpose as it delivers essential security features along with must-have modules for Mac optimization. This tool cleans unneeded applications and persistent malware in one click. It also protects your privacy by eliminating tracking cookies, frees up disk space, and manages startup apps to decrease boot time. On top of that, it boasts 24/7 tech support. The following steps will walk you through automatic removal of the Search Encrypt Mac infection. Check whether the searchencrypt.com redirect problem has been fixed. If it perseveres, go to the Uninstaller option on Freshmac GUI. Locate an entry that appears suspicious, select it and click Fix Safely button to force-uninstall the unwanted application. Go to Temp and Startup Apps panes on the interface and have all redundant or suspicious items eliminated as well. The Search Encrypt malware shouldn’t be causing any further trouble.